For this episode of the Memekast, we are very pleased to bring you Digital Rust. He gave us an all exclusive, all original mix of 3 released and 6 unreleased tracks! Expect a new forthcoming EP on Addictech in the very near future. He played an epic sunrise set at the Temple of Flux this year and we knew that we had to have him on the Memekast. But he made us wait until he had a release under his belt. His first offering, Loophole, out now on Addictech Records, takes listeners on a ride through dirty wobbles, thick basslines, talking synths bits, and chunky beats. 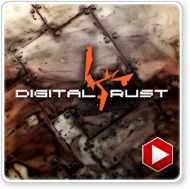 Digital Rust constructs a twisted soundscape that pulls inspirations from Glitch Hop, Dubstep, and Breaks. what the @#%$!!! this is sooooooooo sick!!!! !